NEW YORK (AP) Ben Simmons knows some people want him to shoot more. The 21-year-old rookie likes to shoot. He just likes rebounding and setting up his teammates just as much. 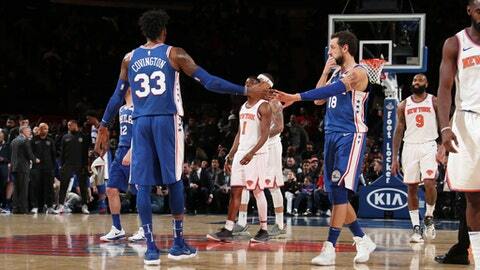 Joel Embiid had 29 points and 10 rebounds to celebrate his 23rd birthday a day earlier, Simmons finished with a triple-double, and the Philadelphia 76ers used a big final period to rally past the New York Knicks, 118-110 on Thursday night. Embiid doesn’t see why his teammate should shy away from a style of play that resulted in his second straight triple-double. The Sixers, who hold the sixth spot in the Eastern Conference playoff race, trailed by as many as 13 points in the third quarter before storming back in the final period, going on a 20-6 run during the last five minutes of regulation. Simmons finished with 13 points, 12 assists and 10 rebounds. His last three assists couldn’t have come at a better time, sparking a 6-0 run that led to Philadelphia’s impressive comeback. Dario Saric had 21 points and 12 boards, JJ Redick added 18 points and Robert Covington chipped in 15 for Philadelphia, which was able to rebound from a tough loss Tuesday night to the Indiana Pacers, who currently own the fourth seed in the East. Michael Beasley had 24 points and 13 rebounds, and Courtney Lee and Trey Burke each contributed 16 points for the Knicks, who have lost a season-high nine straight games and 17 of 18. The Knicks’ last win came on Feb. 22 at Orlando. ”I think in the fourth quarter we need to learn how to close out a game,” said Enes Kanter, who added 14 points and 10 rebounds. Kyle O’Quinn finished with 15 points and 10 rebounds for a New York team that has lost its last eight games at home. The Knicks haven’t earned a victory at Madison Square Garden since beating Brooklyn on Jan. 30. New York led 104-98 on Emmanuel Mudiay’s jumper with 5 1/2 minutes remaining in the fourth quarter before the 76ers mounted their comeback. After a Philadelphia timeout, Simmons found Embiid for a driving layup to cut the lead to four points. A missed hook shot by Kanter led to another assist from Simmons, this time finding Saric for a 3-pointer that cut the deficit for the 76ers, 104-103 with 4:18 left. The 6-foot-10 Australian point guard then made up for missing a pair of free throws and fed Covington for a 3-pointer with 3:23 left capped an 8-2 run to put the visitors up 106-104. But Lee answered back with a 16-foot jumper to tie it up on the next possession. Embiid was then fouled and made one of his two free throws to give Philadelphia the lead for good, 107-106 with 2:45 to go before Redick followed it up with a 3-pointer from the corner in front of the Knicks bench. An errant pass by Beasley on the ensuing possession led to a 3-pointer by Saric behind the right wing to put the game out of reach at 113-106 with just 1:58 left. 76ers: Embiid became the first Sixers player to notch 40 20-point performances in a season since Andre Iguodala (2007-08). . Philadelphia improved to 3-0 against the Knicks this season. It’s their first series win over New York since 2008-09. . Simmons, Iguodala and Aaron McKie are the only three players in the organization since 1983-84 to post consecutive triple-doubles. Knicks: Mudiay had 12 points. Simmons joined Oscar Robertson and Magic Johnson as the third rookie in NBA history to reach 1,000 points, 500 rebounds and 500 assists. The 21-year-old Australian joined the special club when he picked up his fifth assist of the night in the second quarter, setting up Covington’s 3-point basket. 76ers: Host the Brooklyn Nets on Friday. Knicks: Continue their four-game homestand Saturday when they welcome the Charlotte Hornets.